Remove the wheel cover, if equipped. 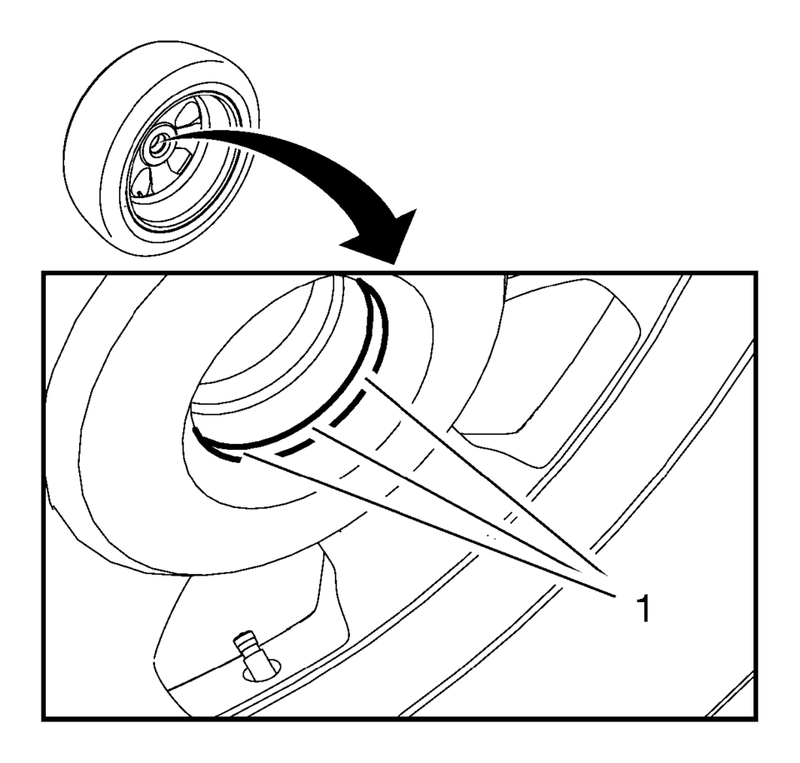 Remove the wheel nut caps (1), if equipped. Remove the wheel nuts (1). Remove the tire and wheel assembly (1). 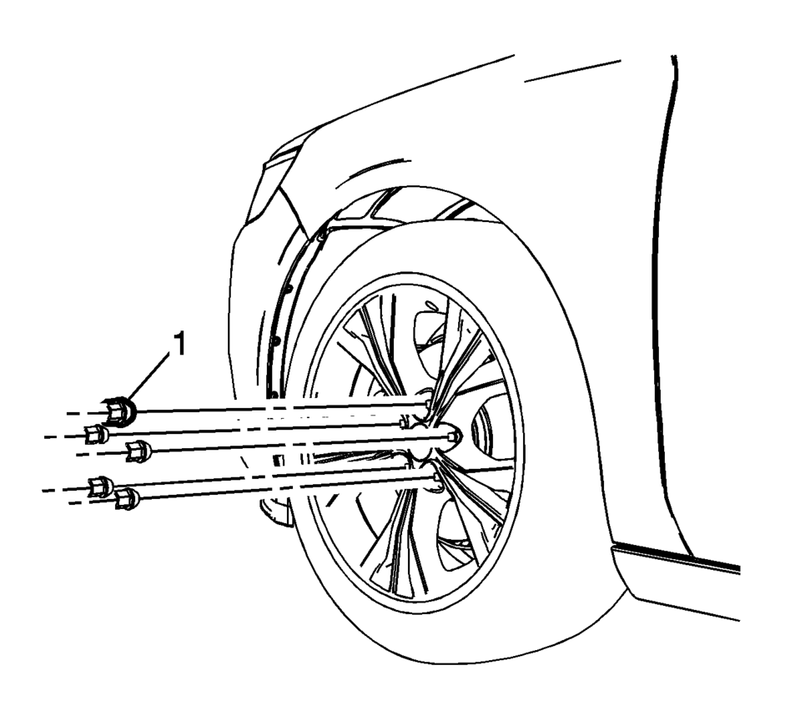 If penetrating oil gets on the vertical surfaces between the wheel and the rotor or drum it could cause the wheel to work loose as the vehicle is driven, resulting in loss of control and an injury accident. 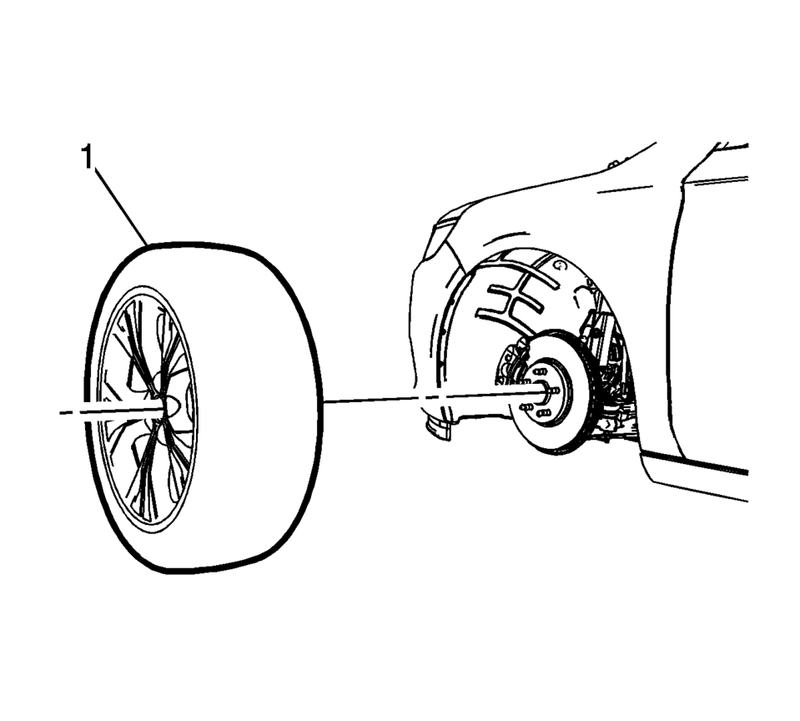 Removing the wheel may be difficult because of foreign materials or a tight fit between the wheel and the hub/rotor. Slightly tap the tire side wall with a rubber mallet in order to remove the wheel. Failure to follow these instructions may result in damage to the wheel. Never use heat to loosen a tight wheel bolt or nut. This can shorten the life of wheel and damage wheel bearings. Hand install the wheel nuts. Loosen the wheel nuts 2 complete turns. Rock the vehicle from side to side. 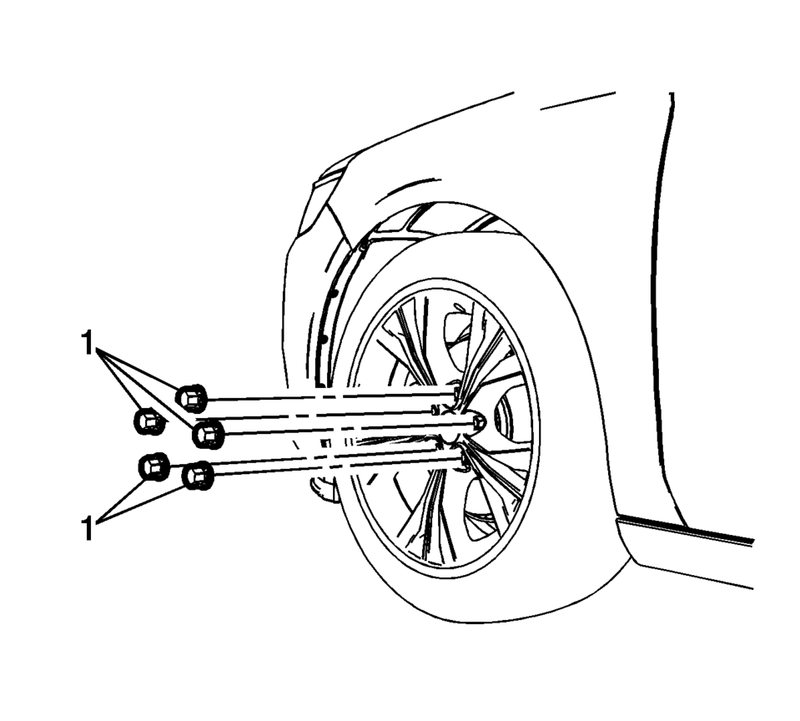 When the tire and wheel assembly loosens, raise and support the vehicle. Refer to Lifting and Jacking the Vehicle. 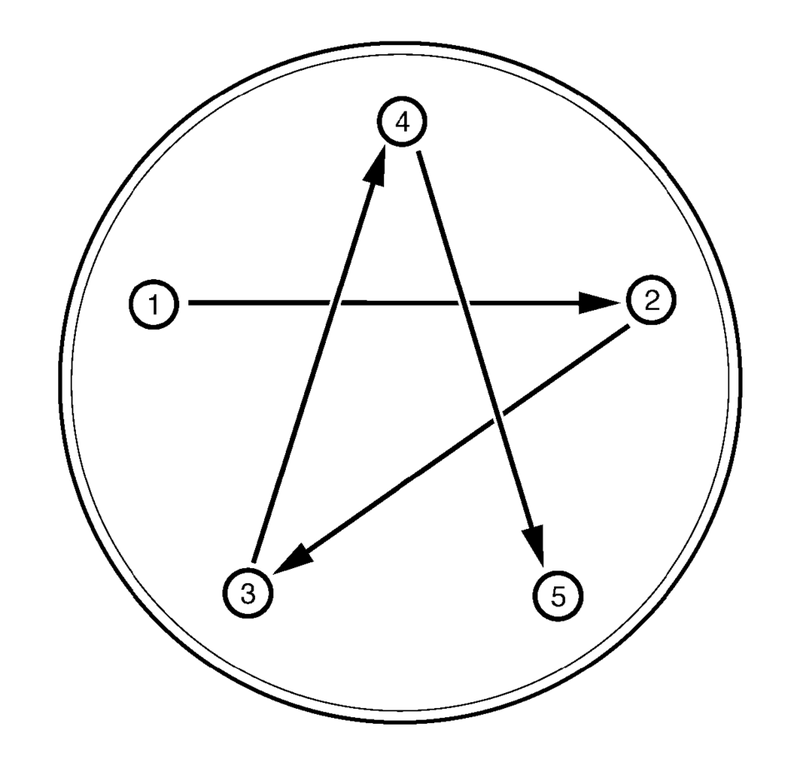 If necessary and equipped , remove the center cap. Before installing the wheels, remove any buildup of corrosion on the wheel mounting surface and brake drum or disc mounting surface. Installing wheels with poor metal-to-metal contact at the mounting surfaces can cause wheel nuts to loosen. This can cause a wheel to come off when the vehicle is moving, causing loss of control and possibly personal injury. Do not use power grinding tools to clean the brake rotor or drum to wheel mating surfaces. Using a wire brush or wire wheel, clean the wheel to brake rotor or drum mating surface. Using the CH-41013 Rotor Resurfacing Kit, clean the rotor or drum to wheel contact area. Using the CH-42450-A Wheel Hub Resurfacing Kit, clean the surfaces around the wheel studs. Clean the threads of the wheel studs. If the threads of the wheel stud are damaged, replace the wheel stud. Refer to Wheel Stud Replacement or Wheel Stud Replacement. After cleaning all of the wheel and brake rotor or drum contact areas, use brake cleaner or denatured alcohol to remove any dirt and debris from the wheel nuts and the brake rotor or drum. Inspect and clean the contact areas of the wheel. Refer to Wheel Mounting Surface Check. Apply a small amount of lubricant to the inner diameter of the wheel hub pilot hole (1) where it contacts the wheel hub flange. Refer to Adhesives, Fluids, Lubricants, and Sealers. Install the tire and wheel assembly (1). Never grease or lubricate wheel nuts, studs and mounting surfaces. Wheel nuts, studs, and mounting surfaces must be clean and dry. Tightening the lubricated parts can cause damage to the wheel studs. This can cause a wheel to come off when the vehicle is moving, causing loss of control and possibly personal injury. Hand install the wheel nuts (1). Improperly tightened wheel bolts or nuts can lead to brake pulsation and rotor damage. In order to avoid expensive brake repairs, evenly tighten the wheel bolts or nuts to the proper torque specification. Install the wheel nut caps (1), if equipped. Install the wheel center cap or wheel cover, if equipped.